“We’re focusing on diversity within community, and community in diversity,” said Detwiler. Complex musical numbers are sung in a variety of languages, including Korean, Latin, Zulu and English. Alongside these songs, each member has also prepared a personal faith story that shares a time in their lives during which they experienced God directly and profoundly. These stories have been developed over many weeks and help to give context and real world connections for the group’s theme. Some of these stories are dramatized, others simply spoken. The group has prepared short dramas demonstrating Biblical stories, such as that of the Good Samaritan, in a relatable manner. The program also includes a story for young audience members (or at least young at heart), helping to reach out to people of all age brackets. Sophomore Lauren Myers speaks to the group’s stage experience in helping to make these dramas and stories a success. “We really highlighted that aspect of our group strength,” said Myers. The group features five sophomores, two juniors and a senior, chosen through auditions last spring. The students represent a wide array of academic disciplines, talents and cultural backgrounds. “We have a great jazz pianist in Julian Harnish,” said Detwiler, explaining how this talent has proved useful for multiple songs. Detwiler also points to sophomore Yejin Kim for introducing the group to a Korean worship song, and sophomore Rebecca Choi for stepping in alongside Kim to help others in learning the language. The group works to highlight the unique talents and knowledge of each member, while also working with each other to grow and improve. “It’s always great to see a new program develop, based on the personalities and strengths of the students. I enjoy this group’s sense of humor and their willingness to be open to developing their skills,” Detwiler said. Prior to the start of classes, Parables spent upwards of 40 hours in approximately five days in rehearsal to develop the program. During this time the group worked to memorize music as well as brainstorm “ideas for the program and story content,” said Detwiler. In order to keep the music fresh, the group now rehearses several evenings each week. “I’m excited for the chance to work with these wonderfully kind and talented individuals throughout the year,” said Myers. 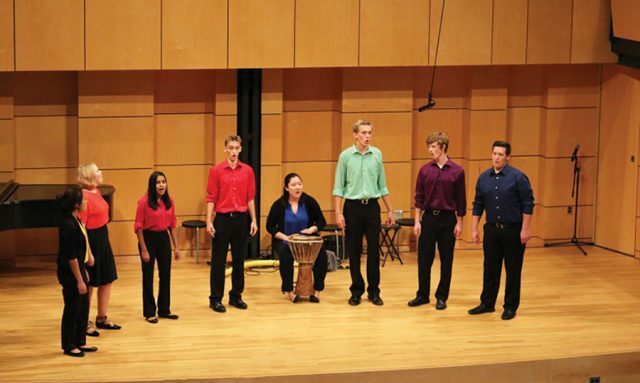 Parables next performs on Oct. 7 at 8:30 a.m. for the Homecoming weekend alumni breakfast, preceding their fall break tour that will take them to Virginia, Maryland and New Jersey. Specific performance dates are still being determined and more will be added throughout the year. An updated performance schedule, as well as more information about group members, can be found on the GC website.